Computer nerd Harry J. Vincent ( ???) and his girlfriend Kathy (Marcia Clingan) have developed a system to manipulate slot machines and other games in Las Vegas. They make a bundle of money, and escape before they can be caught. But there’s a problem. The sadistic thugs Al (Morghen) and Kurt (Conte) also want their earnings. So it’s up to the cop Ryan (Svenson) and his helicopter-driver buddy Lou (Williamson) to track down the baddies and save the day. The Italian film industry is noted for its “homages” to more popular films of the time (less charitable people would say “knockoffs” but in their creation they seem to become something altogether new - check out the Italian post-apocalypse films), and Deadly Impact seems to be cut from the same cloth as 48 Hrs. (1982). Instead of Eddie Murphy and Nick Nolte, it’s Fred Williamson and Bo Svenson (who we would rather see anyway). Fred once again brings his magnetic personality, and he has good chemistry with the more hard-nosed Bo. They play ‘Nam buddies who will destroy any car to get the job done. The car stunts are the highlight of this film. There are some definitely cool chases, jumps, flips and wrecks. But there isn’t really much in the plot department, and the film lacks one big, major bad guy. It could have used more goons for them to beat up/kill, or even some plot twists. Somewhat disappointingly, it’s a standard, down-the-line cops chasing baddies movie. Fabrizio DeAngelis AKA Larry Ludman, the legendary producer/director and the man behind Operation Nam (1986), delivers a competent, if a tad bland movie but with some standout stuntwork. Let’s not forget the great John Morghen AKA Giovanni Lombardo Radice as one of the thugs. In real life a very cultured, educated man, he’s known for his thug roles and his appearances in Italian 80’s horror-boom movies. The silly dubbing washes away a lot of his - and others’- performances, but add a charm of their own at the same time. The same can be said of the music, which is enjoyable and catchy, but perhaps inappropriate to the scenes it is accompanying. Though it was largely shot in Las Vegas and Phoenix, it still retains its Italian feel, and while it’s not exactly a must-see, fans of Italian action or the stars involved might want to check it out. 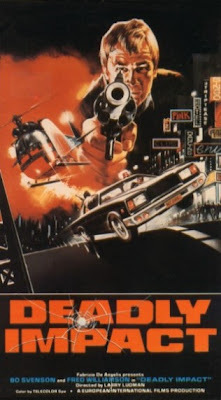 Released on VHS in the U.S. on the great Vestron label, Deadly Impact might not be the best example of Italian action, but as a way to while away an hour and a half, you could certainly do worse. Also check out a write-up by our buddy, The Video Vacuum! I think there was a good movie hiding somewhere in here. (As you said, the car chases are good.) I think the ending needed to be pared down and Fred's role needed to be expanded. No problem, buddy! We are in total agreement. This should have been a Fred classic like Black Cobra, but it was just missing energy and action. A very accurate review. This movie had surprisingly little action and originality for an Italian movie. Thanks! We totally agree this should have been better.